You must be a member of the Helsinki Healthy Living & Fun Group to attend this activity. Would you like to join this group? 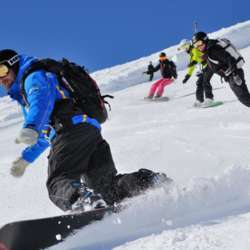 It's time to learn snowboarding properly in a course. This is a 2 day course (sat-sun) for beginners. If you are not a beginner you are also welcome to join at the same time, but on your own as we will be busy trying to stand up. Rental includes: shoes, board, helmet and goggles (if needed, usually not needed at the beginning). This is a real bargain and great opportunity! Course starts at 11:00hrs, we need to be there 30min in advance to fit the equipment. Course ends at 13:00hrs on both days. Once the list is sent to the instructors (on 18.1. ), registration UI is binding! There is no reimbursement for last minute cancellations. If you cancel after you have been confirmed, you are subject to their cancellation policy: you will receive in any case an invoice from Serena plus 15€ fee. Payment is made at the place, preferably with debit/credit card. Anyone who has not been enrolled, won't be able to participate. Looking forward to have good healthy fun with like-minded positive people!